#1 Marine LED Brand for Commercial and Recreational Boaters. 7mm (0.3") thick, 50mm (2") dia. See a "How2" install video. These dome lights LED conversion kits (marine LED bulbs) come in several models* and are ideal for replacing your existing incandescent or halogen dome light bulbs. Unique, cutting edge, internal circuitry and the highest quality components make Dr. LED's the longest lasting, most energy efficient LED products on the market. These high-quality marine LED bulbs produce a warm white light, and are the perfect way to reduce energy consumption on your boat. These marine LED bulbs have a long service life, are shock proof, and UV, lead and mercury-free. These LED bulbs are ideal for cockpit lights; map reading lights, emergency lights, etc. 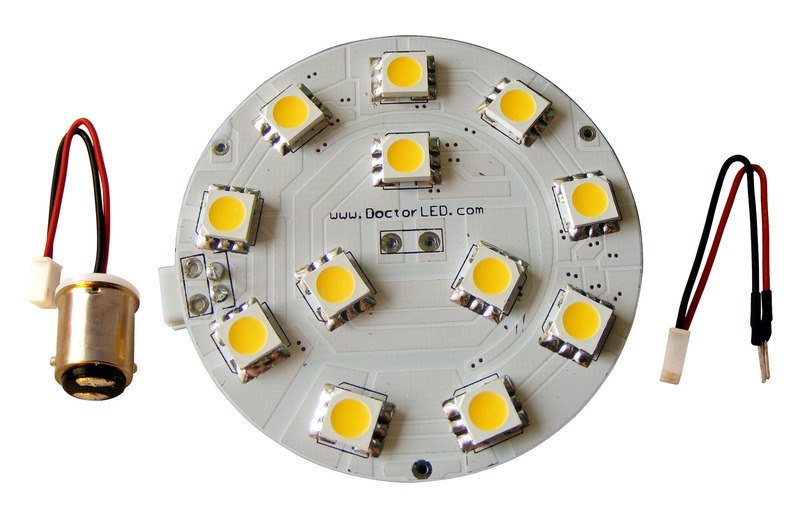 These LED bulbs produce a flood-type beam and work well used in many light fixtures. *Two voltage models to choose from: 12 VDC and 24 VDC systems. 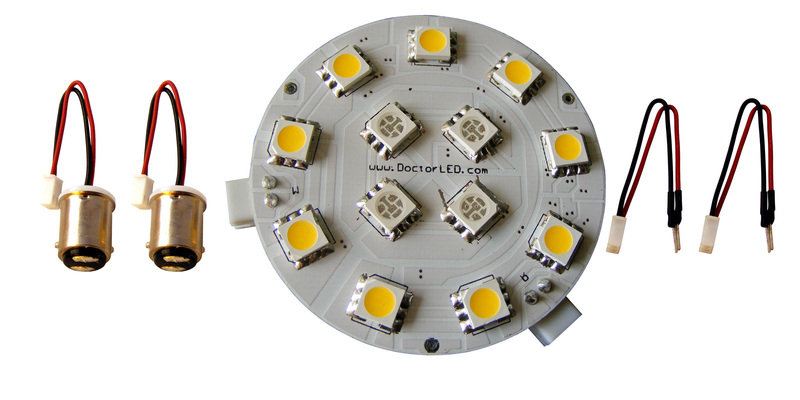 Two light output models to choose from: warm white or warm white / red light. Both bayonet double contact non-index (BA15D) and bi-pin connection pigtails are provided. Contact Dr. LED for single contact pigtail(s). 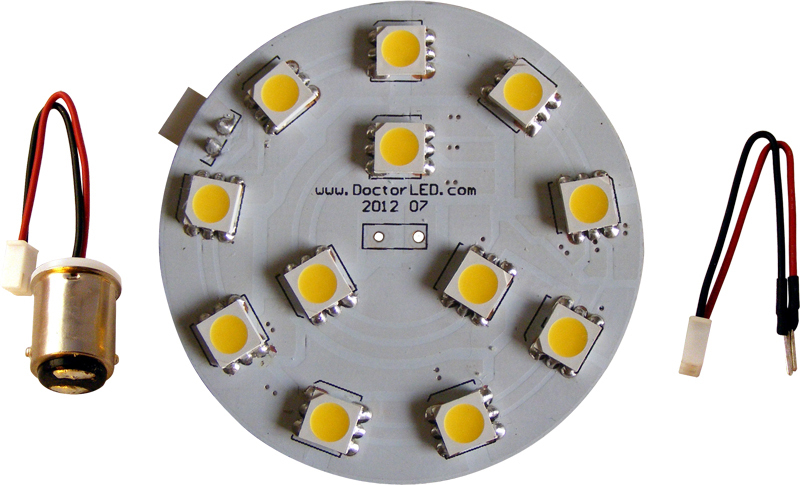 Bi-color models are designed for dome lights with two original bulbs (one red and one white). Actually usable light at a reasonable price. Patented & specially designed for the marine environment. 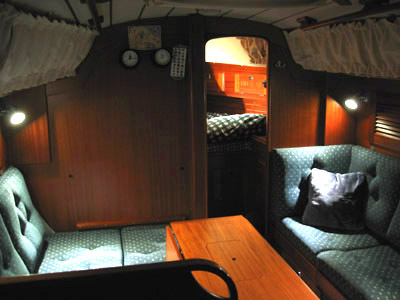 Testimonial from a Hallberg-Rassy 34 owner. Reproduction of information, images and artwork used in this site without the written consent of Dr. LED is strictly prohibited. Dr. LED 2003 to 2019. Patents Pending. All Rights Reserved © .